Between more expansive offerings and growing free content, Internet learning has come a long way in the past several years. Most of the focus at Innovation Toronto has been on the positive changes these models have brought, though today’s contribution looks at the flip-side: namely, problems with traditional higher education that are making the Internet space seem so attractive. Brianna Meiers writes for a website that recently featured a complete list of distance education institutions, and her thoughts below should be valuable to any reader looking for a more comprehensive view of the modern educational landscape. 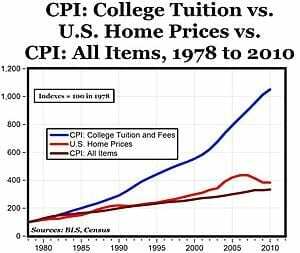 The cost of college tuition has risen dramatically in recent years – and today, these prices have made higher learning virtually unaffordable to many American families. While many students from low-income families are able to collect financial aid in order to earn a degree, educational experts argue that student loan debts tend to put graduates at a disadvantage as they attempt to enter the job market. A study by Fastweb and FinAid.org publisher Mark Kantrovitz indicates that student debt is another factor contributing to educational stratification. Most students from low-income families who wish to attend college must collect some sort of financial assistance. Upon completion of their degree, however, students are usually required to begin repaying the loan debt. And as tuition prices have spiked, the amount of these debts has also reached astronomically high proportions. Kantrovitz notes that 1.5 percent of all college students (undergraduate and graduate) will graduate with “six-figure debt.” This percentage is much higher among graduate student groups, such as doctoral students (9.7 percent), law school graduates (36.2 percent) and medical school graduates (49 percent). However, undergraduate students from low-income families also incur six-figure debt at a higher rate than their wealthier counterparts. Students whose net tuition price (courses, room and board and meal plans) was at least 18 percent of their family’s total income were four times as likely to incur six-figure debt. But many students whose debts do not reach six figures are still unable to manage the repayments – and these shortcomings put them at a disadvantage in the job market. Sandra Block of USA Today recently wrote that the average student incurs $24,000 in loan debt, while 10 percent incur debts of $40,000 or higher. Graduates who find high-paying jobs are usually able to effectively handle these debts – but in the current recession, positions that award adequate compensation to loan borrowers are rare, and competition to fill them is high. And students who are unable to satisfy their debts on a regular basis suffer from increased interest and incurred penalties. According to the U.S. Department of Education, one in 10 students with debt were forced to default on their loans within two years after graduation. “We need to ensure that all students are able to access and enroll in quality programs that prepare them for well-paying jobs so they can enter the workforce and compete in our global marketplace,” said U.S. Secretary of Education Arne Duncan. Many students struggle with debt because they do not understand the legal implications of student loans. NOLO features a database of articles and reports meant to assist students who struggle to make loan payments or are considering default. In addition, the site provides information about budgeting for student loans and accessing financial records from one’s alma mater.